i am so excited! this year we tried growing sweet potatoes by our own for the very first time and i really wasn’t sure if it will work out. i read somewhere that they need more than 100 days of sun, but that you cannot put them outside before end of may/ beginning of june, that they only grow in temperature above 24°C and so on. all in all not really the conditions that you have in our part of the world. but we gave it a try. put two small sweet potato plants in a large black (to optimize the temperature above 24°C) container and watched them growing. and the plants grew very well and have been very decorative on our terrace. but we had no idea of what happened underneith the earth in the meantime. 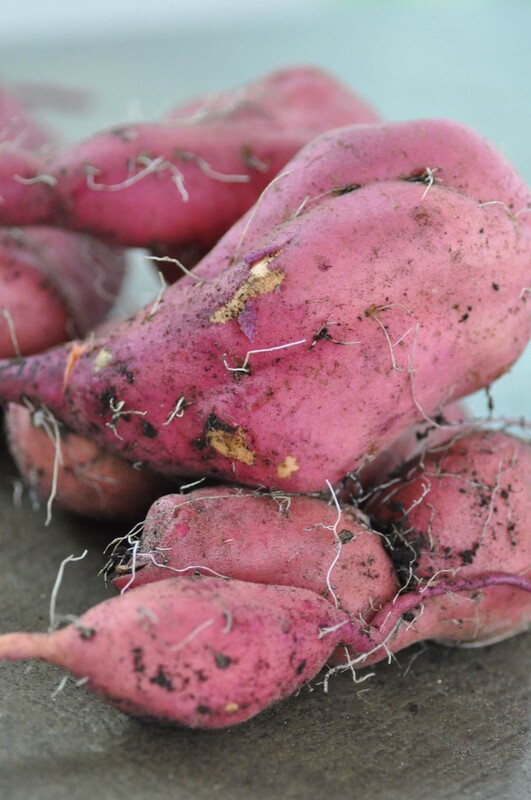 growing nice sweet potatoes or nothing … everything was possible. so we waited until mid-october. the leaves started to turn yellow, so we took a deep breath and started to dig in the container. still afraid of finding nothing or very tiny potatoes…. super-cool thing! we will grow some sweet potatoes on our terrace next summer again, for sure. and maybe we will also try growing them outdoors and will enjoy many sweet potatoes dishes like this one with kale, yummy! 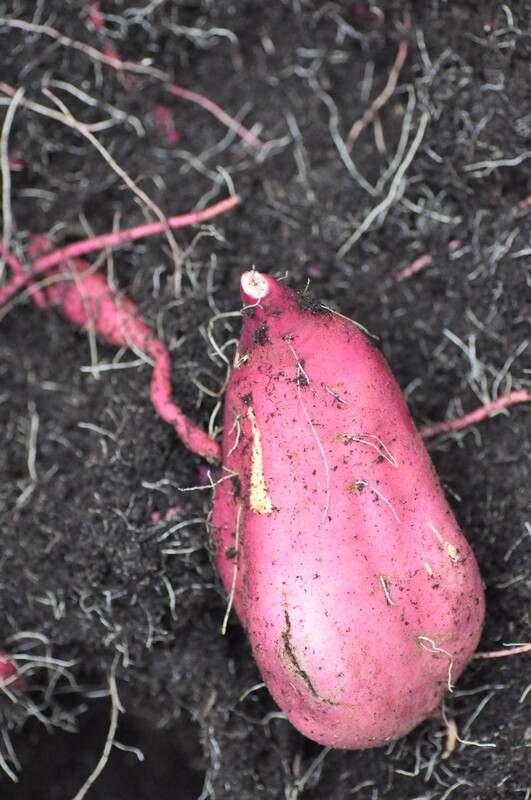 This entry was posted in autumn, gardening, summer and tagged sweet potato by The Cook. Bookmark the permalink. This is lovely! I just found your site now, I am also a terrace gardener, always look for nice food to grow there. I am from Asia and love this kind of sweet potatoes we have in Asia (taste and texture different from the ones we get in Germany). Where did you get the seed / seedling? Did you grow from potato instead? I will try next year! Hi, thanks for your comment! We bought the plant from a local gardener. But for next spring I will try to grow one from a potato. I definitely will write a post about it, when I start them in late January.